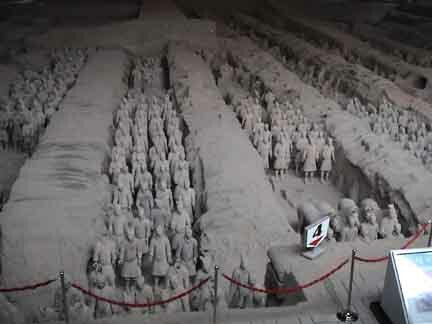 The Terra Cotta Warriors were created by the first Emperor of China, Qin Shi Huang di pronounced - Chin Shi Huang di. This amazing but megalomaniac man conquered and united China from a collection of warring states to become its First Emperor. He built the Great Wall and amassed great works of art. Obsessed with a quest for the secret of immortality, 70,000 workers built his tomb said to be filled with legendary treasures. His 3000 wives and concubines followed him to the grave. Over 8000 fantastic life-size clay warriors protected his tomb. The Famous Terracotta Army - is now referred to as the eighth wonder of the ancient world. Terra Cotta Army archeological site, view of the main excavation with thousands of soldiers. Our group, led by Mark, practices Five Elements Qigong near the ancient Bell Tower located in the center of Xian. Terra Cotta Army archeological site and interpretive center. Terra Cotta Army archeological site. View of Terra Cotta Horses. The colorful Tang Dynasty Dancing Show provides delightful evening entertainment. The ancient Bell Tower in the center of Xian. Street leading to the famous Daoist Temple of the Eight Immortals. Xian, view of a main avenue and park from the top of the ancient city wall. Photographs copyright © 2006 Rebecca Kali. All rights reserved.